I have always loved bird watching and enjoy nature whenever I can, so I guess I could be called a nature nerd. Our family had recently heard about Eagle Watching Days at several locations throughout Missouri, and since I love to bird watch, we loaded up the car and took a drive in search of our nation’s official mascot, the bald eagle. It was about an hour away and we saw live captive birds and educational demonstrations, but were only able to see the eagles from very far away. After driving all that way and only viewing them from inside a building, it made me want to see bald eagles up close and in their natural environment. After watching these majestic birds soaring in the sky, it really made me want to see them again, and right here where I live. Why should I have to drive an hour away from home? After doing a little bit of research, I learned that bald eagles visit Missouri during the winter months. They migrate south in search of food when waterways and lakes north of us freeze, making their main food source difficult to access. 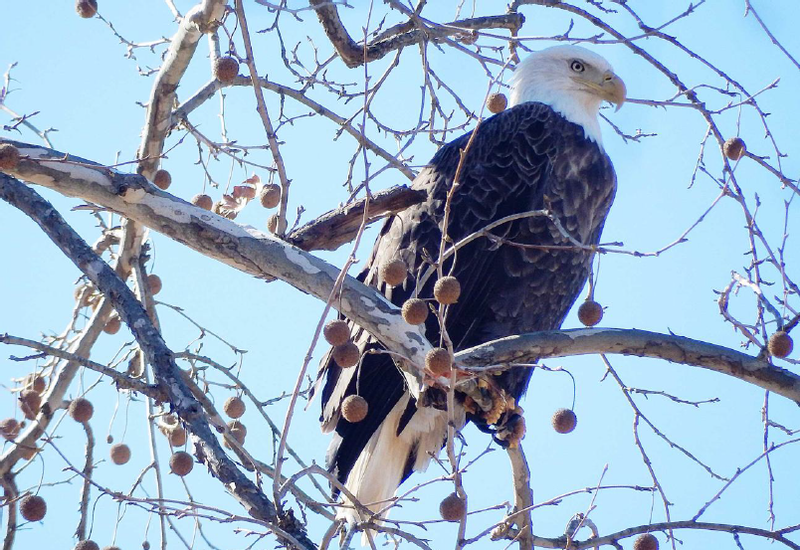 There are some eagles that reside in Missouri all year round, but most bald eagles seen in the winter months are only temporary residents until they begin moving back north in February. I was thinking why would these birds just stick to visiting the places where the Eagle Days festivities were being held? 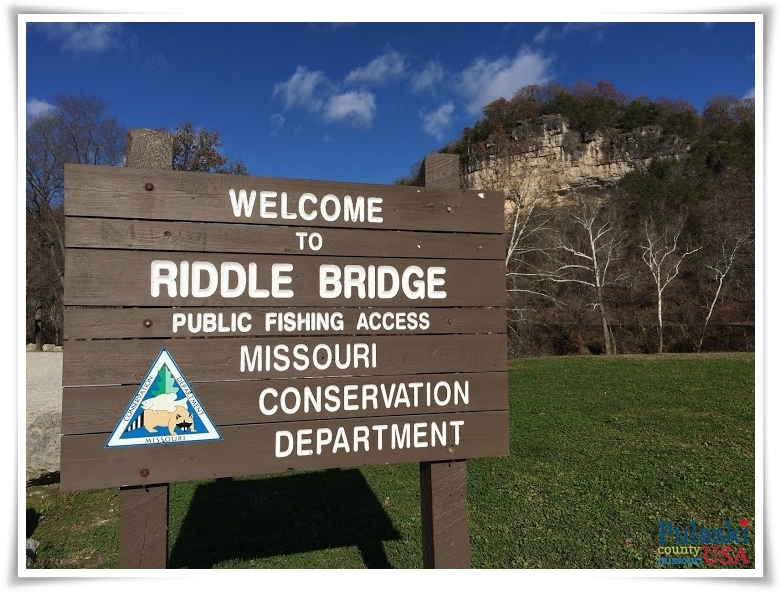 Fish composes a majority of their diet, so why wouldn’t they be here in Pulaski County, where there is excellent fishing from two major rivers, natural springs, and streams. I put on my thinking cap and decided search out these majestic birds right here where I live. Bald eagle near the Big Piney River in southern Pulaski County, Missouri. Photo by Terry Primas. I got up early on a cold Saturday morning, made some coffee and ventured out. Since my youngest daughter was awake as I was planning to leave, I invited her along and boy was I glad I did. I decided to search out an open, larger section of water where there is good fishing for my first attempt. We only ventured out to one place that morning, a local boating access point on the Gasconade River. When we arrived at the Missouri Department of Conservation Riddle Bridge Access area, we immediately spotted a large falcon very close to the parking lot and stopped to watch it as it was resting on the branches of a nearby tree. I knew if there was another predatory bird nearby, it was sure to be a good spot for eagles too. After the first bird flew away, I looked all around me to notice that the foliage closer to the bluff and along the river was completely covered with ice crystals. It was an absolute winter wonderland! I had not experienced this since moving to Missouri more than 7 years ago and I was in awe. I stopped to take some pictures wishing my camera would capture the real beauty all around me the same way I was seeing it. I then looked up and all around in the trees, and there it was, a beautiful mature bald eagle perched right across the river from us. We stayed in our vehicle and just watched it for a few minutes enjoying the moment before trying to get a closer view. We crossed the bridge and were able to get a bit closer, but still stayed in the car to watch under cover. My daughter just viewed her first bald eagle up close with both her own eyes and with the assistance of binoculars. It was amazing! We both looked at the bird up close with my scope and admired the details of its yellow hooked beak, white head and tail feathers, and the details of its sharp talons. After a few minutes and as more cars started to travel around in the area, the eagle decided there was too much company and flew away. It was truly a special moment, watching bald eagles right here where we live in Pulaski County. No more driving far away for me, I was now enthralled in this new expanded bird watching hobby. A few days later, I decided to take a chance and go on another adventure. I was eager to see more eagles and I wanted to share it with another one of my kids. I love to fish and was near a trout stream, so I figured if it is a good fishing spot for me, it should be for eagles too. We arrived in the late afternoon at Stone Mill Spring. As we exited the car to walk the trail to the spring, I knew it was a great place to seek out viewing eagles because we immediately heard one calling and it sounded really close. We did see two eagles flying along the Big Piney River as we walked closer to the spring, but when we arrived three herons immediately flew away right out of the spring. We stopped walking before continuing any further into the fishing area, and saw a large mature bald eagle perched up in a tree very close by. We got out our binoculars and scope for a closer view, but made little movement for fear of scaring it away. We were out in the open, under no cover, and were very fortunate to watch and hear it call for about 30 minutes. When the eagle flew away, it was followed by another immature eagle we hadn’t even seen that was perched behind us. 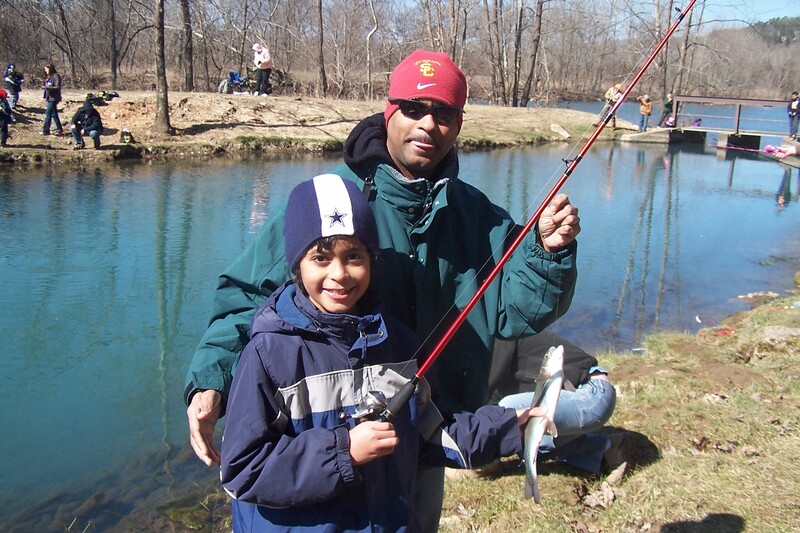 The trout at Stone Mill Spring on Fort Leonard Wood are popular with anglers of all ages, as well as bald eagles. U.S. Forest Service photo. The next weekend, it was time to go seek out more eagles. I am so excited to be watching these awesome birds here where I live that I just can’t get enough. My husband joined me this time and we headed back to the Big Piney River where I had seen some before. This time we stopped in a different area and were very successful in finding plenty to view. As we stopped along the river, we spotted one just across the river from us back in the trees a bit. As we were enjoying the view, we saw a couple more bald eagles were flying up river. These birds are just wonderful to watch fly, their wingspan is larger than any I have ever seen. We then headed to the spring in search of more sightings, but saw none at Stone Mill, but did see more perched along the river. We finished up our eagle viewing with a hike up to the bluff above the spring. The view from above the spring was wonderful, and it was the perfect way to end a great morning. 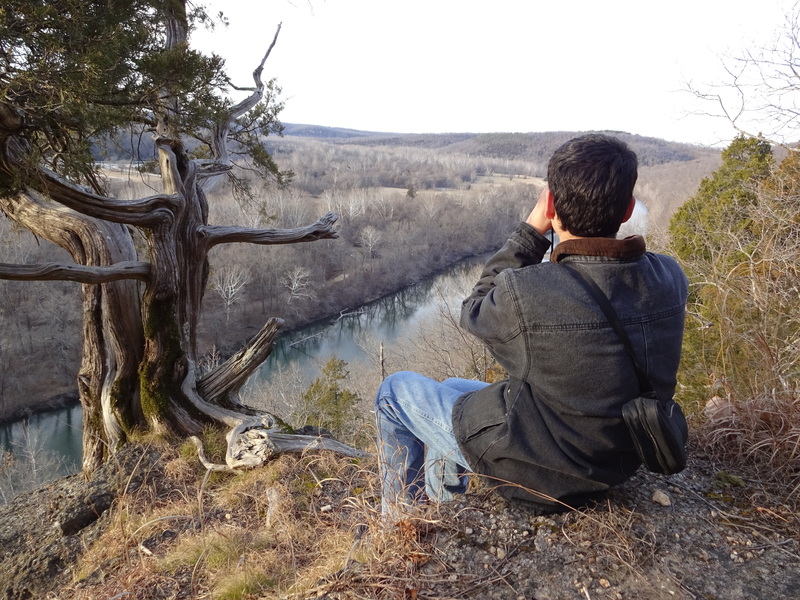 Eagle watching above Stone Mill Spring on the Big Piney River on Fort Leonard Wood in Pulaski County, Missouri. Photo by Katie Dreadfulwater. The next day I was itching to go out and watch again! I had one more person to show the eagles to, my oldest daughter. I convinced her to come along even though she is not much of an outdoors person. We first headed out towards the Big Piney River in search of great views of bald eagles and did not see any along the river this time, so we headed toward the spring. On the way there, we stopped by another good fishing area on the river and spotted an immature bald eagle perched in a tree above a larger pool of water. It was a beautiful bird, large and stout. My daughter was the one who spotted it and had the best view. We continued searching all the way there, not really seeing any more eagles as we drove. We parked and walked back to the spring, and upon our arrival we immediately saw a large mature bald eagle perching in the trees along the stream. We enjoyed watching it only for a few minutes before it flew away. We walked around the fishing area and did not see any more eagles that morning, but did see a pair of pileated wood peckers and a great assortment of smaller birds. It was a rather chilly morning, but we decided to hike the trail behind the spring for a better view. As we were reached the top of the trail, I saw a bald eagle fly directly overhead and it was the best view ever! We both appreciated the sunshine and enjoyed our morning watching for eagles and being outdoors in the magnificent Ozarks. Pulaski County is a short drive for most of Central Missouri- and is the perfect place to eagle watch, without the crowds. 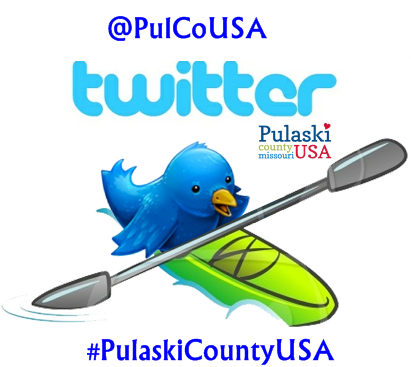 To plan your eagle watching and birding outings order your FREE Visitors Guide at http://visitpulaskicounty.org/contact_us.htm.